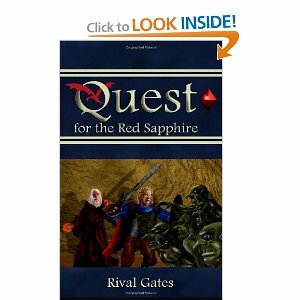 It gives us great pleasure to introduce another of our fine authors Rival Gates, who has written an exciting fantasy Sci-Fi novel titled “Quest for the Red Sapphire” Book I covering around 490 pages, the first of a series of three books in total. Rival was born in Port Huron, Michigan USA and moved to a suburb of Toronto, ON, Canada at age five. His father was a technical writer and magazine editor while his mother was a high school teacher. Always interested in creative writing Rival participated in many contests in grammar school which led to writing his own short stories. It was at the early age of thirteen that he began on a story, what later became known as the “Quest for the Red Sapphire” by the time he turned age fifteen. He was obviously born with a natural inclination for self-expression and creativity, and kept consistently as working on this project until he had perfected it. However, a lull ensued whilst attending Michigan State University, where Rival graduated with a degree in Communication and found that he had a gift and enthusiasm for speaking in public. With his first ever Computer, the Author dusted off his old story notes and began to revise the work once more. Not a day had passed by since he had first created this project with a certain enthusiasm, where he did not consider some aspect of its outline. An entire series was planned and put in order to be written. Back-stories were formed and the series was ready to produce. Rival proving to be a perfectionist-driven author, and when he came to us for representation, we wanted to help him and nurture along his obvious desire in becoming a full time writer. Rival will go far in his career as a teller of great tales, because it is in his blood. You have been trained all of your life to obtain to a great power. Now you must find it before a sinister element does…and they have already killed your parents in their search! The young half-elf general Linvin Grithinshield has been called home from the Goblin Wars to his childhood home of Sartan. His Father has gone missing (and is later discovered to have been killed) and he is to take over his family’s lucrative merchant business. He is not home long before his Mother is murdered. In a final letter, Linvin’s Mother reveals that he was meant to be the Master of the fabled Red Sapphire, capable of giving its owner unimaginable power. The assassins clearly seek the stone as well. Linvin must find the gem before they find it or him. Read more about the adventures of Linvin Grithinshield and the outcome of his fate … and order your very own copy of “Quest for the Red Sapphire” Book I is now available at Amazon.com undergoing its first promotion and reviews. More to come your way soon about this exciting new author…! Another Thrilling Edition titled “SAPPHIRE CRUCIBLE (Book 2 of the Sapphire Chronicles Series) available now from Amazon.com. If you’ve read “QUEST FOR THE RED SAPPHIRE BOOK I in this series than this is a must read…. Captured! In Book 2 of the Sapphire Chronicles, Linvin and his party find themselves prisoners on the maniacal Lord Mandrean and his Necromancer. Now they must find a way to escape, find the Red Sapphire, and make it home alive. Along the way they must fight ever-growing odds of survival.